Contrary to the widespread belief that threatened carnivores and human beings cannot co-exists using the same spatial locations, a new study from the neighboring country of Nepal shows that a large carnivore- the globally endangered tiger- do adapt to such situations and even takes a night shift to co-exist in a place frequented by human beings. A camera trap study done by researchers at the Michigan State University in USA, Institute for Social and Environmental Research and Department of National Parks and Wildlife Conservation in Nepal at the Chitwan National Park in 2010 to 2011 found that tigers changed their spatiotemporal activities to avoid human detection. According to the study, humans, vehicles and tigers were all using the same roads through the forests for their routine explorations during the period. However, to avoid the human presence, tigers restricted their movement through the overlapping routes to night when human activity was very low. “In contrast to the general belief, we found that tigers and people frequently co-occurred at fine scales both inside and outside the park in both years,” point out the researchers in the paper which was published in the Proceedings of the National Academy of Sciences. The study which put camera traps in different parts of the national park found that despite the heightened human activity during the day time, the tiger density at the study site was greater than that of similar sites in the neighboring India and other South East Asian countries where human intervention on tiger reserves are very low. They have also found that a 20 percent increase in the human density in the locality does not affect the tiger density at the Chitwan National Park which is considered as one among the few tiger reserves in the world that can support more than 25 breeding female tigers. It has also found that the tigers in the study area in Chtiwan were one sixth less active than their counterparts in tiger reserves of other South East Asian countries were human activity is controlled. 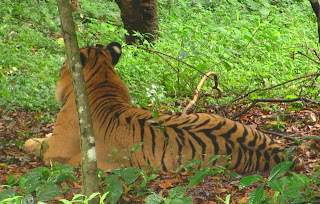 Moreover, there was a 55 percent increase in the presence of local residents in the study area, which according to the paper, has caused the tigers to avoid small trails used by locals as well as to keep themselves to the inner forest areas of the park, bringing the tiger density inside the park more during the last year of study. However, the study also points out that the presence of high prey base and low levels of poaching also helped the co-existence of human beings and the tigers in the area. Interestingly, it found that the prey base was increased after the implementation of conservation oriented policies due to increase in the biomass as well as reforestation of the areas outside the park. The new study contradicts the basic rationale of many conservation programs which focus on evacuating human settlements from protected areas fearing human-animal conflicts and adverse effect on threatened organisms. Instead, the study supports the idea that effective curbing of poaching is the key to increasing tiger density, than restricting human density in a protected area. “Our findings affirm the notion that effective management policies, such as those policies that improve habitat conditions and lower exploitation, are more important to tiger conservation than human density per se”, says the study. Moreover, the study provides a ray of hope at a point of time when earth is getting crowded with the rapidly expanding human population shrinking the forest habitats.